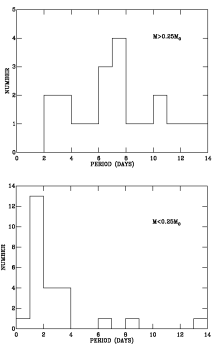 Littlefair et al (2005) describes our discovery of the rotation period for 32 stars in IC348. We have made available a great deal of supplementary information for this dataset. First there is the catalogue of sources we observed. You can also access plots and data files for all the objects which have decent lightcurves. We obtained three lightcurves for each object, with exposure times of 2s, 30s and 300s. Rather than presenting all these, we have chosen the best one for the source in question. For the objects with periods, we've chosen the lightcurves from which the period was determined, with three exceptions. In the cases of stars 21, 55 and 147 we chose the 30s lightcurves as they contained data from more nights than the 300s ones, and thus make a more convincing case that the period is real. The lightcurve, periodogram, folded lightcurve and finding chart can be accessed via the catalogue of objects for which we derived periods. For those objects where we failed to find a credible period we normally present the lightcurve with the highest signal-to-noise and more than 50 data points. However, in the cases of stars 79 and 135 there were many more data points in the 30s lightcurves we present than the 300s we would otherwise have chosen. These lightcurves, along with periodograms and finding charts are available via the catalogue of objects where we couldn't find a period. In Mayne et al (2007) we generate an empirical isochrone for IC348 and argue that IC348 is 3-4 years old. This new age could reveal important evidence for the effects of local environment on stellar evolution. As the distribution of rotational periods is similar to the ONC and the disc fraction is higher than expected for such an old cluster, both could be due to the relative quiescence of the environment of IC348. Hα sources from Herbig (1998) .